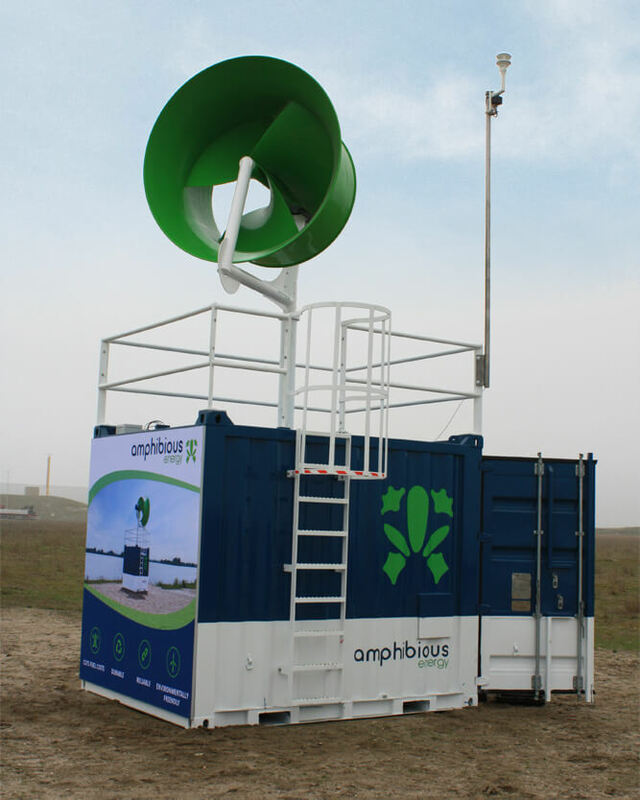 Amphibious Energy is a private Dutch company, with a focus on providing transportable renewable energy to offshore and onshore off-grid locations. We have extended knowledge and experience in wind turbines and electronics and are specialised in designing reliable, efficient, autonomous green energy systems. The company was founded shortly after the first proto-type EnergyPods were tested in the Southern North Sea at the beginning of 2017. As part of this development, Amphibious Energy has modified Ventus Nautilus’ specialized and patented wind turbine (on the onshore market since 2012), for it to be used specifically in the offshore environment. After a successful introduction of our EnergyPod, Amphibious Energy has designed three additional types of EnergyPods; the Twin Head EnergyPod (wind-driven only), the Hybrid EnergyPod (wind and solar), and the Twin Head Hybrid EnergyPod (wind and solar). Amphibious Energy has now moved globally, with agencies in Malaysia and in Brazil. Our aim is to deliver renewable power and storage solutions, both onshore as well as offshore, which are cost-effective, durable and environmentally friendly. Research and development forms a key part within our company. Willem has more than 15 years of work experience in both academics and the E&P Industry. He has worked in South Africa, the USA, and the UK, and currently resides in the Netherlands. Willem co-founded Amphibious Energy with a key focus to pair renewable energy technologies with the oil and gas sector, and support the off-grid onshore sector with a transportable, renewable power solution. Educated as an economist, George has over 13 years experience as a consultant in finance, the public sector and the sports industry. In 2010 he made a switch to renewable energy, and in 2013 co-founded Ventus Nautilus that developed the patented compact wind turbine. George co-founded Amphibious Energy with a key focus to utilise the patented wind turbine in offshore as well as onshore sectors.